​Who we are, what we have to say, and how we say it are all shaped by the cultures that have shaped us. For me, born in Ireland and raised in Canada, those experiences flavour every story I tell. And just like any flavour steeped into the whole, it can be hard to isolate. To be honest, I’ve never tried. I am Irish. That voice is surely in my writing. I hear it in my Irish characters like Kit in GREENER GRASS or Ellie in UNSPEAKABLE as clearly as I hear it in my mother’s voice. They sound just like Mom or Granny with their sharp wit or lilting laments. That flavour is as strong as Granny’s tea. But what flavour is Canadian, exactly? I grew up in Canada. I attended Canadian schools. I became a citizen, married a Canadian and gave birth to two more. My books are Canadian, simply because I am, but surely some of that mysterious Canadian-ness is there flavouring my writing as well...right? It’s subtle, but there just the same. And now that I think about it, it’s just as essential. Without it, my writing would lack heart, optimism, and empathy. Despite all the tragedies my characters face (and, boy, do I give them a lot!) they overcome because of those exact qualities: heart, optimism, and empathy. I think the same can be said of the Canadian spirit. When Jack meets Mahingan in TIMBER WOLF and the boys (an immigrant and an Algonquin) learn to respect their similarities and differences; when the Canadian doctors, priests and nuns risk their lives in WILD GEESE to help the thousands of families fleeing famine; when Devan finally sees things through the victim’s eyes and stands up to the bully in EGGHEAD; and when the townspeople of Rimouski open their homes to the Empress survivors in UNSPEAKABLE -- that is not only Canadian content, it’s Canadian spirit. Canada is young, relatively speaking. And maybe it’s because I teach high school students, but I see great things associated with youth. Enthusiasm. Potential. Openness. Above all, I see an eagerness to make a difference and the optimism to think we can. We don’t have to look far in Canadian history or Canadian communities for examples, but we do have to look. We have to see it. And celebrate it. 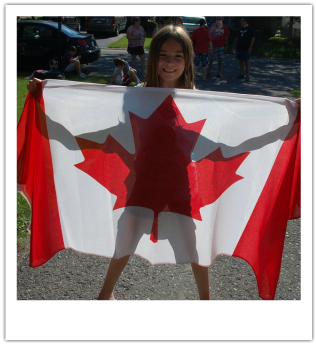 Perhaps we can’t fully define “Canadian story” because, like those youth, we are just finding our voice. Just learning our stories. Just starting to really live them and own them, really. And, in some cases, just discovering those one’s we’d long forgotten, like the Empress of Ireland. Ever heard of it? Did you know it was the worst maritime disaster in Canadian history? Or that more passengers died May 29, 1914 in the sinking of the Empress of Ireland (840) than either the Titanic (832) or the Lusitania (791)? I didn’t. I graduated from Canadian schools and universities, heck, I’ve been teaching in them for years -- and, shamefully, I’d never even heard of the Empress. But as I asked around, apparently most of us hadn’t. The Empress of Ireland was lost to the St. Lawrence that fateful night a century ago, but perhaps the greater tragedy was how its story, the stories of all those aboard, was lost over time. It makes me wonder how many more of our stories we’ve lost. Like that grade 12 student, maybe we have reached that place where it’s time stop and look back -- to learn from the past, from what worked and what didn’t -- before we look forward to what’s ahead. My research helps me stop and look back. I didn’t know anything about Grosse Isle, the quarantine island that played such a key role of safety and sacrifice during the typhus epidemic of 1847, until I started researching WILD GEESE. Nor did I know much about the Algonquin culture and experience of the timber men who logged the Ottawa River until I started writing TIMBER WOLF. UNSPEAKABLE was no different. I’d never heard of the ship when my editor mentioned it to me. I knew nothing of the story -- but that was exactly why I wanted to write it. I needed to learn it, to relive it. I needed to tell it. So yes, my stories are “Canadian” because I am Canadian. But I like to think my historical ones are part of every Canadian’s story, too. That in giving them a small taste of what I’ve found, they will go and learn more for themselves. Because really, these are our stories. These are a part of our history. The good and the bad, they shape who we are. Everybody’s got one. The least we can do is listen, remember -- and pass it on.